05 January – Ghana: The death of Major Courage Quashigah was reported from faraway Israel with disbelieve. JusticeGhana was instrumental in the compilation of the tribute of the one of the Ghana’s finest Army Rangers. 12 January- Haiti: Earth quake registrating 7.0 on the Richter scale shook the county, killing about 230,000 and leaving more than a million homeless. The Mills-led National Democratic Congress (NDC) remembered their faraway cousins by donating some $3000.00 to alleviate their problems. The International community, especially those from the West championed humanitarian relief efforts in this part of our world. 06 March– Ghana: Ghana celebrated its 53rd political independence from Great Britain. President J.E.A. 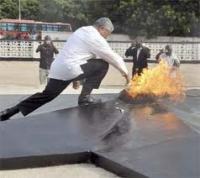 Mills dedicated the occasion to the Ghanaian Youth, by stating at the Independence Square that “Today is a day for you the youth, and you must be proud of what you have achieved as regards your invaluable contribution to celebrating such a momentous occasion on the nation’s calendar. As a Government, it is our conviction that getting you actively involved in our Independence Day activities is very critical to ensuring that you appreciate the struggles and toil that have brought us this far and also to inculcate in you a sense of nationalism and belonging. You must be proud of your heritage and you must be proud to be Ghanaian,” the president added. 14 April- Europe and the Global Travel: Ash Cloud causes travel chaos, for six days in April; most European flights were grounded after the Eyjafjallajokull volcano in Iceland erupted. 20 April- US: The BP oil spill took headlines for three months after an initial explosion on BP Deepwater Horizon rig in the Gulf of Mexico. It is now recognised as the biggest environmental disaster in US history. 06 May– United Kingdom: A dramatic political “change of guards” took place at Buckingham Palace. After 13 years of Blair-Brown Labour political dominance, everything changed within seconds, in a way few of us had thought. Electoral participation the UK hyped, with 61.5%. The victors- Cameron & Clegg in, Brown out! 02 June- Taxi Driver killing spree in Cumbria, UK: Taxi driver Derrick Bird went on a wild shooting rampage along the west coast of Cumbria, killing 12 people, including his twin brother. He is said to have been motivated by a family feud and financial worries. 02 July- Johannesburg: Ghana Black Stars’ earlier struggles which it managed to overcome by printing her name on the international soccer map with four (4) points behind Germany, which finished with points six (6) to top Group D, was shattered by a controversial hand ball from Uruguayan Suarez. Uruguay hammered Ghana 4-2 on penalties after a 1-1 draw in a quarter-final that will remain a scar on Black Stars Asamoah Gyan’s football career as the outstanding world-class footballer nervously slammed the ball off the bar, missing the crucial penalty in the final minute of extra-time after Luis Suarez was sent off for handling Dominic Adiyiah’s header. 26 July- Pakistan: The Islamic Republic of Pakistan suffered probably one of its worst devastating natural disasters as uncontrollable floods, crumbled roads and homes. More than 20 million lives were affected. 05 August- The Hague, The Netherlands: Naomi Campbell arrived at The Hague amid intense media scrutiny to appear as a witness for the prosecution in the war crimes trial of the former Liberian president Charles Taylor. In 2003, the Chief Prosecutor of the Special Court for Sierra Leone- David Crane, signed and filed the indictment against Taylor while he was president of Liberia. For the sake of justice, other witnesses might probably be summoned. Ex-Presdent Kufuor raises Political white flag: Nana Addo is the Winner! 25 September– UK: ED Miliband surprisingly won Labour leadership over his senior brother David Miliband- a former foreign affairs minister and one, highly tipped for the job following Brown’s exit. After four rounds of voting Ed- who insists he is his “own man” and not in thrall to the unions, whose support gave him victory, secured 175,519 votes, while David managed with 147,220 votes. Ed had declared the era of New Labour over as he sought to distance himself from the legacy of Tony Blair and instead lead a “new generation” back into power. The labour strongman seems to share some of the sentiments being expressed by students over the intended school fees increase and its consequences that face the Conservative-LibDem coalition government. 13 October- Chile: Chilean miners emerge into glare of Global media after 33 miners trapped underground for more than two months, in northern Chile, were safely rescued. They captured heroic national/global welcome. 16 October- Prince William finally pops the question to girlfriend Kate Middleton. 03 December 2010: Ivory Coast: Ivory Coast closed its borders and blocked foreign media on 02 December night in what the UK Guardian newspaper described after its general election as an apparent election victory for the opposition which has ever since been dismissed by presidential aides as “an attempted coup d’etat”. 04 December- Ghana: Squandron Leader Clend Mawuko Sowu, a leading member of the ruling National Democratic Congress (NDC) passes away. 08 December- Ghana: Ex-President Kufuor celebrated his 72nd Birthday in style at his private residence in Accra. President J.E.A. Mills turned on the valve that kicked-start the country’s newly-found oil industry. nothing more than a celebration of military coup de tat! The compilation here is not exhaustive and might have not captured some of the equally important events or impasse!